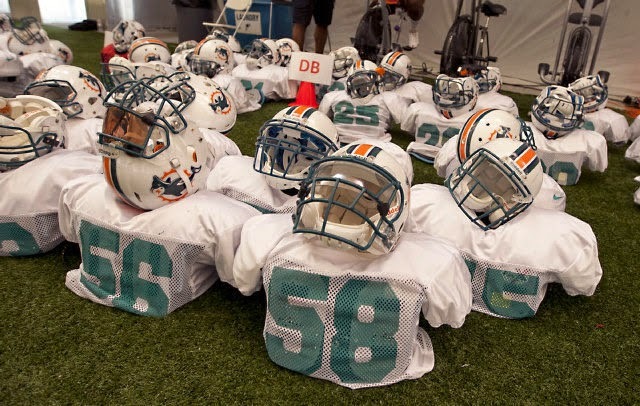 In ten days The Miami Dolphins officially open training camp 2014 with a report date of July 24th, their first fully uniformed practice is Friday, July 25th. Miami's first pre-season game is 14 days later at Atlanta on Friday August 8th. The Bubble Boys offered below need to be paid special attention to between now and those first few pre-season games. This is the fans opportunity to re-familiarize ones self with the names and numbers (Old & New) of our beloved favorite team. ""IT'S TIME"" to start figuring out how many players the Fins should carry at each position as well as discussing who we as individuals and/or as a community would prefer to see in or out of The Miami Dolphins Lineup. 51 Mike Pouncey (Injured, Hip Surgery) Earliest return date suggested is Week Five. If the Dolphins star Center Mike Pouncey were to be relegated to the PUP (Physically Unable to Perform) list through the NFL's mandated first SIX GAMES? TWO potential roster spot openings would become available for any one squad listed below (OL or RB or TE or WR)! While on the PUP list, Pouncey would be excluded from counting toward the active 46 man game day roster! Otherwise, all four squads can be afforded just the one necessary Bubble addition, (if that)! (ON THE BUBBLE) offensive Lineman. Currently! Room for ONE ! Two? 63 Davonte Wallace, OL, 6-3, 308, 22, R, New Mex St.
(ON THE BUBBLE RB), room for ONE. Two? (ON THE BUBBLE TE), room for ONE. Two? (ON THE BUBBLE WR), room for ONE. Two? So it seems as though that it would be quite the trick to go with just 8 Offensive Lineman, if Mike Pouncey were to count as one of the Eight/23/46! In such a case. The Dolphins would actually be going with only two active OLine reserves! Miami has to bring at least ONE from the OLine Bubble in order to field an active eight. Several of the Dolphins OLine prospects are able to play multiple OLine positions, (including Center). Do the Fins bring just one OLineman up from the bubble, who is he, and/or who are they if more than one is your desire toward the active 46? How Bout the running back position? Can the Dolphins possibly get by with just one bubble guy to total only three running backs? Running Back seems to be the position that most requires TWO from the bubble. YES? However, (According to this projection)! Miami's offense is likely to need at least One Bubble Player for each of the Four individual squads while appearing to have just Four offensive roster openings. Do they short the current Tight End (2), or Wide Receiver (4) from an additional bubble guy in order to assure themselves of carrying Four Running Backs? Who makes the active game day 46 at running back? Which Bubbles Float To The Top For You? The Miami Dolphins presently have room for Four Bubble Prospects to total 23 offensive players! Five Bubble Guys! If Pouncey goes to the PUP through week SEVEN? The 6 game PUP list means just that, ""SIX GAMES"", which suggest that Pouncey would not be eligible to return until week eight/game seven (due to the unfortunate timing of our bye week). Coincidentally, Miami's starting Center's week five suggested return happens to fall upon the Dolphins Bye. Therefore, Pouncey is not likely to return at full strength to the active roster prior to week six and/or game five to begin with, even if he is kept on the active roster! Should Mike Pouncey go to the PUP and be deemed unavailable for two games more than the injuries earliest suggested game five return to the field? Or do the Fins go without the fifth bubble option for at least one forth of the season? Thanks for an Open-Minded Read, and we look forward to your angle of view : )) !! TOTAL DEFENSE (20). To Be Continued!